Bayside Engineering prepared a Traffic Impact and Access Study for the proposed residential development in Littleton, Massachusetts. The development is located on approximately 23 acres of land on the north side of Great Road, east of Grist Mill Road. The site previously was a vacant, wooded parcel of land. The project consisted of 142 residential townhouse units and 48 residential apartment units. Parking for 411 vehicles is provided. Access to the project is provided by way of a full-movement driveway, Boxwood Drive, to Great Road and an emergency access only driveway to Grist Mill Road. impact report summarizing work performed with results. 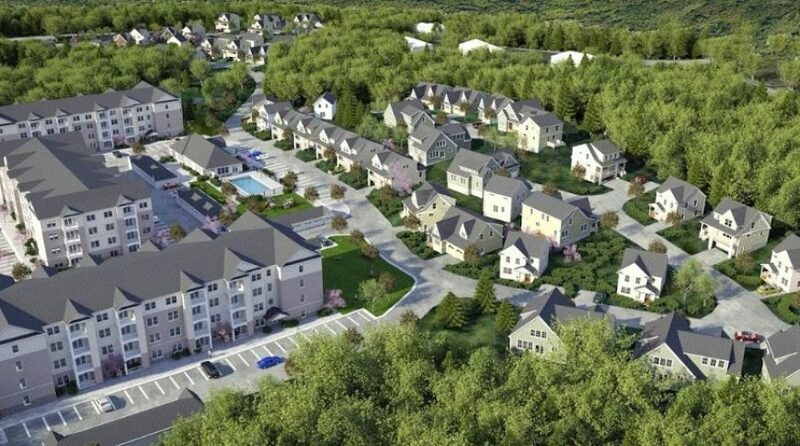 Bayside assisted in securing the Massachusetts 40B Comprehensive Permit, encouraging the production of affordable housing in all communities throughout the Commonwealth. The necessary Highway Access Permit from MassDOT was also acquired by Bayside. Key to the access design was the widening of Route 119 to provide an exclusive left-turn lane. The grade of Great Road was adjusted and the profile was designed to meet MassDOT requirements for sight distances.